WARNING - NEEDS TESTING before you let it loose on your more valuable saves. 1) Install world in normal way. You can do the following steps either before starting a new game using the world, or when you already have a game saved. It will affect all games that use the installed world. Take another copy of the world file and call it XWorld.routableworld. Find the original XWorld.Sims3Pack, and drop it onto Pescado's s3rc.exe. Unpack the Sims3Pack using your favorite unpacker. Important: DO NOT DECRAPIFY! The very largest of the .package files you can find amongst what gets unpacked is the one you want. Rename it to XWorld.routableworld and place in your Installed Worlds folder. 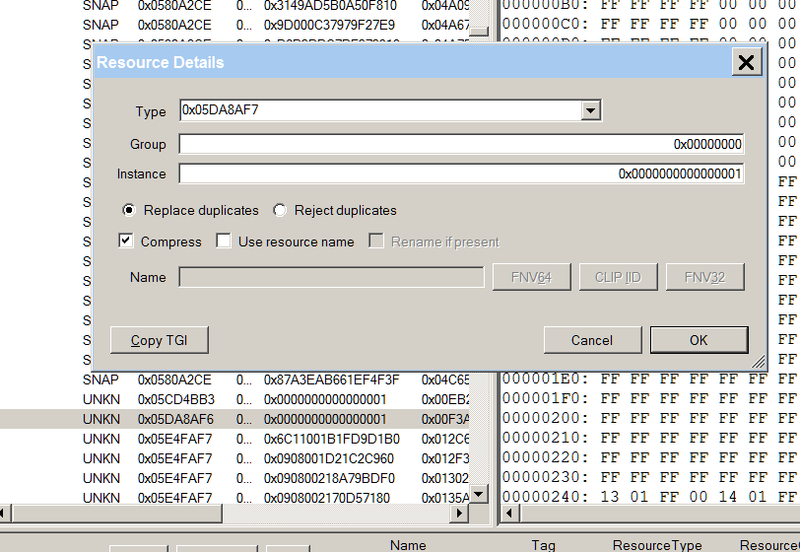 Using s3pe, open the .routableworld file. Delete one resource in the file, the one of type 0x05DA8AF6. If your .world does not have one of this type listed, it means it has no terrain painted with either sims unroutable or camera unroutable paint, and you need not bother to follow this process at all on that world. When you want the world totally routable, copy XWorld.routableworld to XWorld.world. When you want it back to normal, copy XWorld.originalworld to XWorld.world. The effect of changing it back to normal routing after you have placed some lots on unroutable terrain is that sims can still autonomously route to the lots, but you cannot click on the terrain, even on those lots, and direct a sim to Go Here. This applies even when one of those lots is the home of the sim you are playing. I did not experiment to see whether plonking a premade lot into one of those lots would overcome that. Next post: discussion about objects such as street lamps blocking lot placement.